When Doc took the DeLorean back to old west in Back to Future III, he picked a rather specific year: 1885. 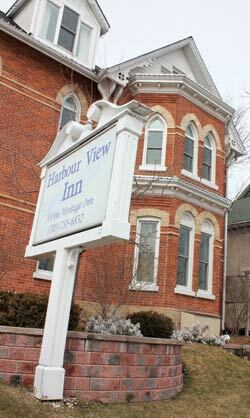 While Hollywood took us an imaginary trip to the wild west; a very real 365 days of adventure happened in 1885, including the birth of what is now Barrie’s Harbour View Inn. While this brick heritage building was being constructed for postmaster John Forsythe in Ontario, Louis Riel returned to Canada and the western plains were alive with strife between Canadian forces and aboriginals in the North-West Rebellion. The Canadian Pacific Railway was completed. The Statute of Liberty arrived in New York City, Dr. Grant of Iowa performed the first appendectomy and the world was introduced to rabies vaccines and hideaway beds. If you found any facts in the above paragraph fascinating, a tour through the hallways of Harbour View Inn may be just up your ally. The red brick building looks like it could be someone’s rambling old mansion on the corner of Berczy and Dunlop street downtown Barrie. Swing open the front door, and the possibility is still there when you’re greeted by a quaint lobby, elegant twisting staircase and working vintage record player. It’s an intimate environment and you have to meander between the floors to realize there are eight suites including a spacious penthouse to choose from. 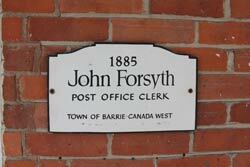 Each room is named after former Barrie mayors: Robert Simpson, Henry Sewrey, C.H. Ross, F.E.P. Pelper, A.E.J. Creswicke, J.M. Bothwell, S.M. Wells, and G.A. Radenhurst (who got penthouse honours). The length of tenure is on each door, and historical articles and photographs dot the hallways interspersed with the art-for-sale of local talent Joan LeBoeuf. Every mayor was unique and so is each room’s décor, although commonalities exist throughout. Antique lamps and night tables mix with modern upgrades like flat screen TVs. Workstations, Wi-Fi and kitchenettes make the rooms well equipped for short or long stays. 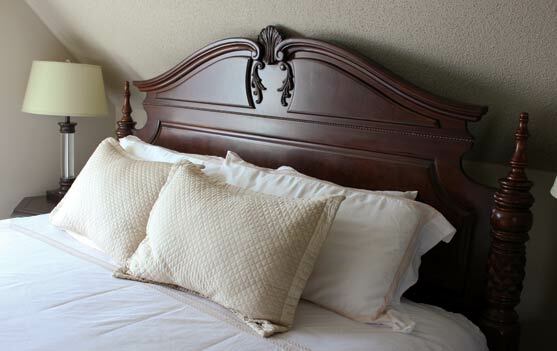 Most suites have a queen size bed with a twin or double pull-out sofa. Some have tub/shower combo, others just shower, so be sure to put your requests in at the time of reservation. The penthouse suite has a four poster king bed in a separate room and luxurious touches like a swanky leather couch and oversize Jacuzzi tub. This boutique operation screams “location, location, location”. Its corner plot is within walking distance to all things downtown Barrie, offering great proximity to nightlife, shopping, waterfront and of course, golf. Harbour View offers stay and play packages with Tangle Creek G&CC and Heritage Hills GC. Staff will arrange your tee time, shuttle you to and fro and then you can let your two feet take you where you please. It’s an attractive bonus to be so conveniently car free. No need to worry about getting a little tipsy (or being a downright lush). It’s your golf getaway, unwind and enjoy. Your hosts are not who you may expect. Four years ago Harbour View, was purchased as a turnkey operation by an executive recruiting firm, which now operates out of the inn as well, explains manager Maggie MacMurchy. “It’s been a lot of fun,” she says of the company’s foray into hospitality. Much of the original structure has been replaced to meet fire code regulations, but parts, such as the staircase are the real deal. People with mobility issues will definitely want to be sure they have a ground floor suite. The stairs are beautiful but winding and pitched. The building became an inn in 2003, but MacMurchy says at one point it was a medical building and at another housed a law firm. The house still attracts legal eagles with the Barrie courthouse also in walking distance. Executives are the inn’s primary clientele, she says. If a unique, quiet, comfortable sleep with great proximity is what you’re after, then Harbour View could be just the spot for you to get your next history lesson and golf game. Just remember when you’re making decisions out on the course, history often repeats itself! Nominated “Best New Golf Course” in Canada by Golf Digest in 2003, this layout will test shot makers with its strategic design of elevation changes, carries and thought provoking holes. One can really put their game to the test with a slope rating of 146 from the 7194 yard back tees. But novices need not fear: the shorter yardage tees are definitely less intimidating. Check out their hole by hole heli-tour online.